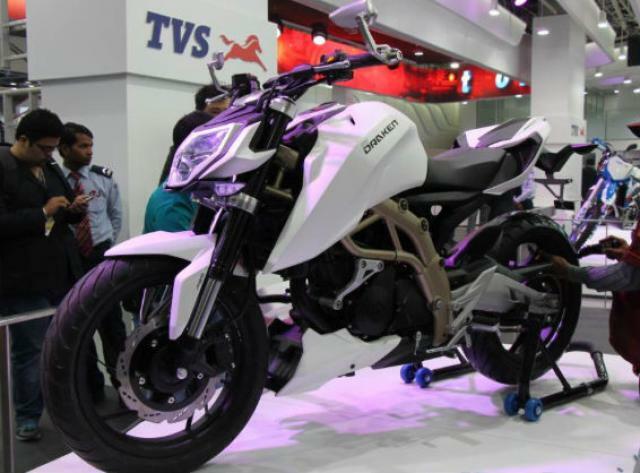 TVS has showcased its new ‘Draken’ concept at the India Auto Expo show. The concept bike is powered by a liquid-cooled 249.2cc, 4-valve, DOHC single cylinder engine, allegedly making 38.5hp at 12,000rpm and 17ft.lb of torque at 9,500rpm. The motor is coupled to a six-speed gearbox and has a ‘reverse free-flow exhaust system’ whereby the exhaust tip exits the side of the belly pan. TVS claim 94mpg and despite no released information on the brakes, ‘ABS’ is marked on the front fender. In April last year, BMW joined forces with TVS to get a foothold in the sub-500cc market. However according to TVS, the Draken is an in-house job with no help from BMW. Here at Visordown, we all think it looks remarkably similar to the KTM 1290 Superduke concept. Pictures and specs of the bike surfaced on Indian motorcycle and car website MotorBeam.